Maelstrom has a lineage filled with champion banners, exceptional lineage, and black genetics. His dam is our 7x champion fawn dam 'Special K' and his sire is our 5x black champion 'Dark Secret'. Maelstrom himself is a 13x champion, the 2016 AOA National Fleece Black Reserve Champion, and 2017 AOA National Halter Black Male Color Champion. She comes with her maiden 2019 breeding to any non-restricted Autumn Sun herdsire. Financing possible. No ARI transfer until payment fully complete. 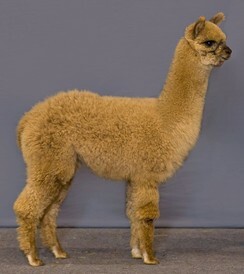 Breeding warranties forfeit if she is bred to male not of ASA for her first breeding. Her first breeding is non-transferrable and is to any non-restricted ASA at the time of contract.